Dress code: white + bright colours, NO RED! NO BLACK! In July 2017 <dienstag abend> travelled to Belarus to visit artist Ales Pushkin and celebrate the slavic rite of Kupalle in a small village Bobr. The rite of Kupalle is a summer solstice festivity, which brings back an old pagan tradition of pre-Christian times. It includes a number of rituals, such as collective building of the Kupalle Wheel, jumping over fire, releasing wreaths in the river, looking for the fern flower, rolling in the dew in the rays of the rising sun and drinking traditional Belarussian “Krupnik” drink made with an extract of 40 local herbs. 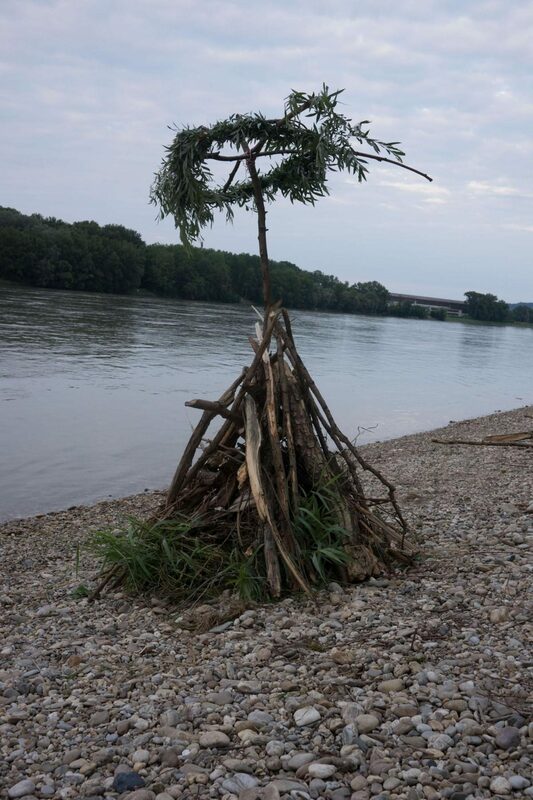 This year Ales Pushkin comes to Vienna to perform Kupalle on the Danube. During the presentation in Hoast, apart from objects and images related to the Kupalle celebration, a selection of video works by Ales Pushkin will be presented – documenting his performances in public spaces across the Minsk region in Belarus and his engagement in activating the local community in his village Bobr. The exhibition should provoke a number of questions regarding tradition, nationalism, radicalism and the role of the artist in today’s society. Ales Pushkin is a Belarusian artist and performer, whose works respond to current political situation of Belarus – a country that since 1994 remains under Lukashenko’s authoritarian rule. Ales Pushkin was born in 1965 to a family affected by soviet repressions. He got his education at the Belarusian State Fine Art Academy at the Faculty of Monumental and Decorative Painting. In 1993 Pushkin managed to open in Vitebsk one of the first private art galleries in the country, which after three years was closed by the authorities. One of his most well-known performances ‘A gift for the president’ (1999) ended up by two-year suspended sentence determined by Belarusian court and regular control by the police. SInce 1997 Pushkin lives with his family in the small rural hometown Bobr. In spite of its remote location, he continues being active in public sphere. The works of Ales Pushkin were exhibited in art galleries and museums in Belarus, Poland, Russia, Sweden, Norway and USA. Stafett is comprised of four distinct artistic positions made up of Minda Andrén (1990, SE), Jennifer Gelardo (1986 US), Flavio Palasciano (1987, CH), and Alexander Jackson Wyatt (1989 AU). The group have been working together on semi-site specific exhibition projects in the format of Stafett and Mirage (an extension of their work as an ongoing series of public projects including a range of other artists and practitioners). Their ongoing work plays with the idea of a continuous group exhibition, introducing single works that embrace an inevitable blurring of their objects, images or ideas as competing aspects of collaboration and autonomy collide. The work shifts between their material and content, slowly merging towards an unknown and undefined end. Stafett Established in 2016. Notable exhibitions include Stafett (2016), curated by Mes Meufs, RAUM D Museumsquartier, Vienna AT, Scamming (2017) curated by Franziska Sophie Wildförster and Flavio Palasciano, Palazzo Lancia, Turin IT and Glass Jaws, GOMO, Vienna AT. Vid Jeraj lives within multiplicity of languages, but mostly among the syncopation. He has punctuated the rhythms in education, tourism and media, while he solos in prose, poetry and essays. In brief, he plays for his soul’s sake… A founding member of Impronedjeljci/Impromondays, d-d-d-drumski pjesnici, he played saxophone with Kreso, Projekt-Projekt, Vlakovi u dzungli, and participated in numerous workshops by the likes of Eugene Chadbourne, Seijiro Murayama, Tomaz Grom, a.o. Still manages concert series with Mocvara Club in Zagreb, writes about music with Express, Radio Orange, Cantus, Lupiga Com, Paris Transatlantic Com, while his work was disseminated and published in Austria, Croatia, Slovenia, Serbia, Montenegro, Italy, USA and France. Zosia Hołubowska is a Polish performer, anthropologist, and ethno-musicologist. They are currently doing a PhD in Practice at the Academy of Fine Arts in Vienna where they research the connection between the experience of traditional music and a community-building space. They have been involved in independent music scene for over 10 years, singing and playing in bands, organising shows, festivals and music workshops and booking tour for bands.